How does a family move a household from Marion, Iowa to only God knows where somewhere out west? Just typing that question makes my head hurt like one of those algebra problems I could never solve on my own no matter how many times the teacher explained it to me. Good thing I married a math guy. 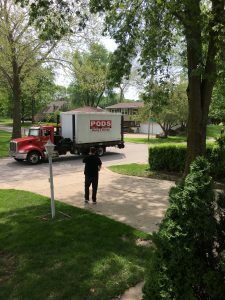 After talking through different scenarios Matthew decided that utilizing a container service like PODs would be best for our situation. We filled the largest POD container they offer with household items. Anything that wouldn’t fit in the POD stayed behind. This meant selling or donating as much furniture as we could part with. Furniture, lawn equipment, freezers, electronics, books, clothing, you name it…nothing was off limits. I cried over My dining and living room furniture even though I knew they needed to go. No matter how many cuts we made we still couldn’t fit it all in the POD. I’m sure there are more things we could have let go, but as time went on fear of the unknown tightened my grip even as Matthew’s seemed to loosen. I still can’t believe he sold his big TV. When the time came to drive away the POD was stuffed to capacity yet there were things that wouldn’t fit. Some friends said they would take care of what was left so we could finally leave. I took pictures, left instructions and some cash for a dump haul and drove away for the last time. As we drove away from the city I glanced in the backseat behind the driver’s seat where Mackenzie would normally sit. His seat was filled with all manner of gluten free road trip snacks, bottled water and vitamins. Mackenzie wasn’t there and there wasn’t a thing I could do about it. My chest tightened and I began to weep. Matthew asked if I was ok. “He should be with us.” is all I could say. Instead he’s in Scotland doing exactly what God ordained for him to do during this time. We moved to Cedar Rapids from Arizona 18 years ago in rented a U-Haul truck with an 18 month old Mackenzie and a blue parakeet. We moved away from Iowa towing a utility trailer behind my Honda Pilot, an almost 17 year old Markus, and a 10 year old chocolate lab. Leaving without him hurt this mama’s heart more than I expected. I thought I was tougher than that; I’m not. One of these days I hope to understand the timing of all of this. All of the pain and the grief of leaving Iowa attached itself to Mackenzie’s seat. Whenever I looked behind I would feel it crash over me all over again. Eventually I had to stop looking behind because it hurt too much. I had to find something in front of me to focus on so that I could help the rest of my family. They were hurting too. Just like there came a point when I had to be ok with the pile of stuff that wouldn’t fit in the POD. I had to let go. I have to keep letting go in order to embrace the Daring Adventure ahead. This morning I awoke to a text with a new picture of Mackenzie now that he’s returned from his outreach in Glasgow. Once again I’m surprised by instant tears and an aching heart. Emotions are tricky little suckers. I don’t know of an easy way to wrap this up because it’s not finished. There will be more pictures and more heartache just as I know there will be more joy and laughter in the days and months to come. Letting go and hanging on. Holding tightly and holding loosely to the things and the people who I have to surrender to God daily. It’s all part of the adventure and we are in it for the long haul. Thank you, friends, for believing with us. It means more than you know. Thank you for writing this. I feel better knowing I am not the only one who struggles with moving forward into an unseen destiny when it means I have to say goodbye to a great chapter of life. How kind of the Lord to give us friends who know what we’re going through. We truly are never alone.